Do you love Farm & Ranch Living? Celebrate the proud heritage and everyday joys of earning a living on the land with Farm & Ranch Living magazine. We share real and inspiring stories about people who believe there’s no better place to live or work than on a farm or ranch. 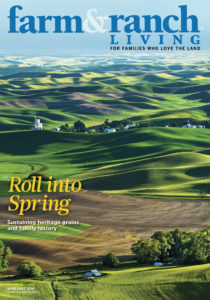 Subscribe to Farm & Ranch Living and never miss an issue. A subscription makes a great gift, too! Are you already a Farm & Ranch Living reader? Share your story or photo or tell us where you found the hidden horseshoe! We always appreciate your submissions and feedback.